TORNADO WARNING in effect until 7:30 p.m.for east central Burlington County. A severe thunderstorm capable of producing a tornado was located over Tabernacle, or 21 miles east of Gloucester City, moving east at 25 mph. Monday's weather was quite the puzzlement. On paper, my forecast verified just fine (in terms of temperatures and rainfall totals). But the day as a whole seemed brighter and drier than I had pictured in my head. Windier too — top gust was a ferocious 36 mph at Sea Girt. There's no doubt about Tuesday's forecast though — it's gonna rain. Periods of steady rain will move through the Garden State through most of the day, during the morning and early afternoon hours at least. Then, the rainfall will become more scattered (i.e. spread apart "discrete" thunderstorms) through the late afternoon and evening. A healthy inch of fresh rainfall seems to be a good bet for most of New Jersey. Some models I've seen have pushed out several inches (2 to 4?) from the late-day batch of scattered thunderstorms. That could lead to some flooding and ponding issues for your evening commute. The only exception to the overall soggy September day might be far southern New Jersey — say, below the Atlantic City Expressway. That area will just barely fall out of the "fetch" of richest moisture and steadiest rain. There will still be clouds and showers, of course. High temperatures for Tuesday afternoon will range from the upper 60s in North Jersey, to near 80 in far South Jersey. A Coastal Flood Advisory continues for the entire New Jersey coastline through (at least) Tuesday morning's high tide cycle. (Remember, back bays peak 2 to 3 hours after the ocean.) An extra foot of tidewater may cause minor water inundation issues. Rain will exit the Garden State Tuesday evening. It will remain mostly cloudy and humid, and we'll probably see some fog develop by Wednesday morning. Overnight low temperatures will only fall a few degrees, to about the 70-degree mark. Wednesday will actually start off partly sunny, warm, and humid — summerlike! High temperatures will rise into the lower to mid 80s, even along the Jersey Shore. I can't rule out a few spot showers during the first half of the day. We'll really have to watch the skies starting Wednesday afternoon, as our next cold front races toward New Jersey. 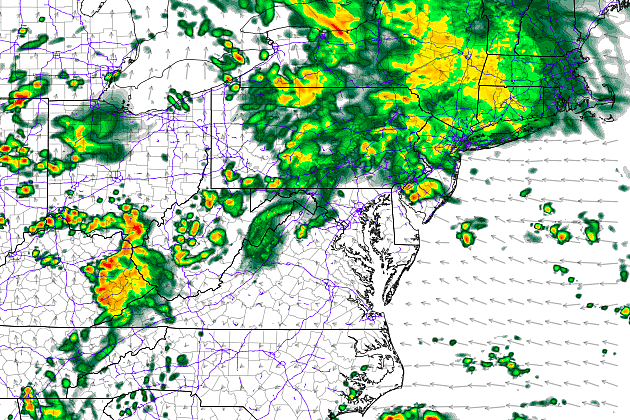 Model consensus suggests this front's rain will arrive in NW NJ around 2 p.m., clearing the state by around Midnight. Timing is everything with this frontal passage. 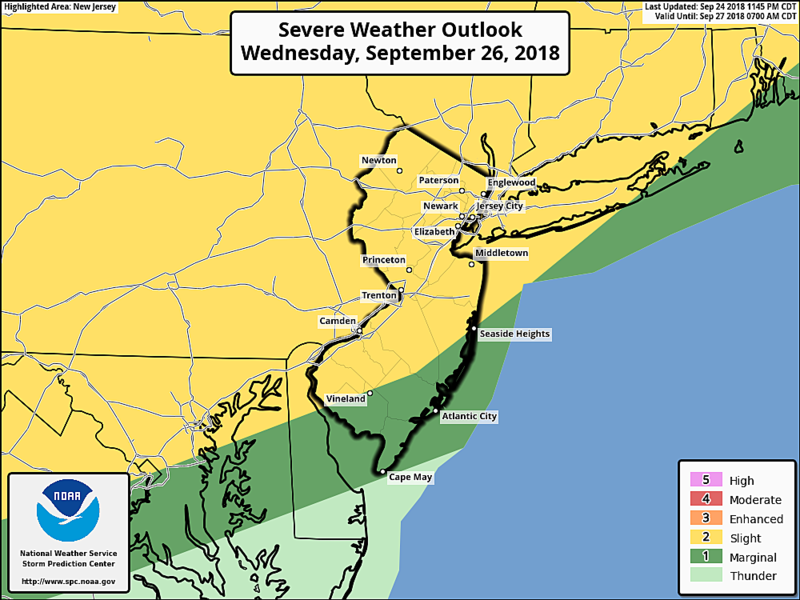 If the storms roll into your neighborhood before sunset Wednesday (around 6:50 p.m.) they will tap into the atmosphere's abundant warmth and moisture and become strong to severe. Gusty winds, frequent lightning, torrential rain, and even some hail are possible. Given the timing, coinciding with the Wednesday evening commute, that could get messy. After sunset, any storms should quickly pulse down to just showers. Behind the front on Thursday and Friday, our weather will turn cooler, drier, and more pleasant. Morning low temps may dip into the 50s. And with a mix of sun and clouds overhead, high temperatures will end up around 70 to 75 degrees. That sounds so cool, but it's actually right on the seasonal normals for late September! Models are still stubbornly keeping a piece of that front stalled over the coast, so I can't completely rule out a few lingering showers Thursday into Friday as well. Again, that would only be along the Jersey Shore. And I'm still not convinced it's going to happen. At the moment, I'm happy to report the upcoming final weekend of September looks pleasantly autumnal!